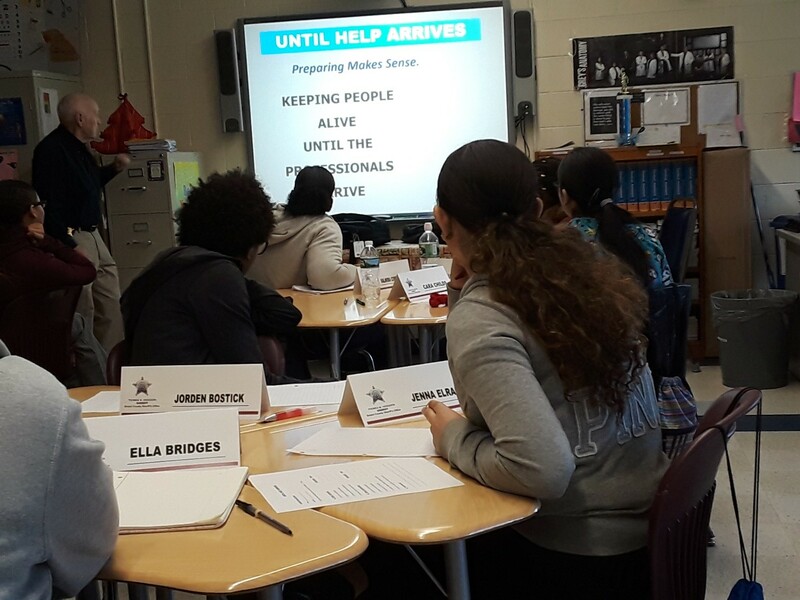 On November 28, 2018, Mrs. Palioglou’s Grade 10 Medical Assisting class was provided a training program called ‘Until Help Arrives’ by Colonel David Gavigan, Commander Special Operations and Captain William A. Camara, Deputy Commander of Homeland Security of the Bristol County Sheriff’s Office. This new program was developed by several state and federal agencies to keep people with life-threatening injuries alive until professionals arrive. Students learned how to interact with the 9-1-1 dispatcher, how and when to move or re-position the victim, how to stop life-threatening bleeding by applying pressure or using a tourniquet, as well as providing comfort to those in need. Students were awarded a certificate at the completion of the training.